Item Number: 100-11 18524 Actual Weight: 38.5 lbs. Commercial-quality dryers provide strong and portable drying power. Use to circulate air, or dry carpet for flood restoration. 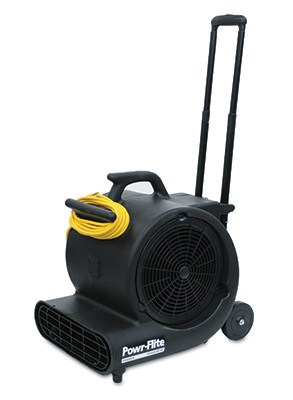 Portable blower has an adjustable kickstand that creates 3 different drying positions, 3 speed settings with lower amp draw for different drying conditions, and 20' long power cord. Built-in thermal overload protection safeguards components in high heat conditions. Features a telescoping handle and wheels for easy transport.